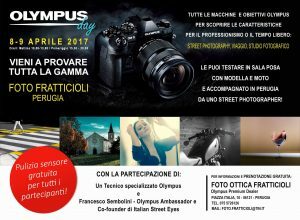 8-9 April 2017, a very interesting Olympus Day in Perugia, at FOTO FRATTICIOLI and with the participation of Visionary Olympus Francesco Sembolini. All participants will have the opportunity to test all the Olympus equipment with the support and advice of Francesco Sembolini and with the collaboration of Foto Fratticioli. You can try in the pose room with a model but also outside to understand the fantastic peculiarities of Olympus for the trip and, above all, for the street photography, the photographic genre for which Francesco Sembolini is well known. This is the official poster of the event, I personally give everyone an appointment in these two days that will be really important for those who want to understand the impressive features of the new Olympus technology, starting with the new top camera Olympus E-M1. We are waiting for you to discover the quality without added weight!